Shahram Solati (born in Sarcheshmeh, Tehran/Iran) is a Los Angeles based Iranian singer.He is Known for the depth of his voice that has been called unparalleled among other Iranian singers.Born in Tehran to a family of artists and entertainers, Shahram studied at Tehran’s Musical High School.There he learned to play the piano and clarinet.At the encouragement of his colleagues and friends, he decided to pursue singing professionally. His debut came with Dooset Daram and Hello, Hello albums.He gained notability with garnered attention of the mature listeners. After the Iranian Revolution, Shahram left Iran.He arrived in Los Angeles in 1985 where from he re-started his music career. His first album in the USA was Tobeh. A year later his second and third albums ,Sabr and Yeki Yekduneh (respectively), brought him fame.These albums earned him the title of ”A Sound Over All Sounds” epithet. Shahram’s position as an established singer has been now well cemented. Reportedly, he is a top choice singer for several Persian record companies. 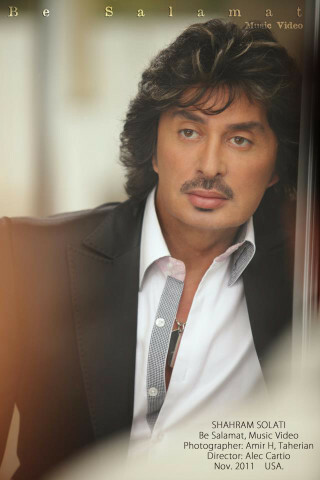 His most artistic albums are ”DOA” and ”HEDIEH”, both of which he presented to his fans in return of their love and support.With Shah Gol, he became known as the ”HERO” of Iranian pop music.His sister Shohreh Solati is also a singer. HE maintains a strong professional relationship with her and the two have collaborated on a few albums. Particularly in Panjareha , both were critically acclaimed.